April starts the beginning of Tampa Bay’s Cobia Migration and while many cobia call Tampa Bay home year round its April through July that herds of migratory cobia invade the bay to feed and breed. Cobia are great fighters, great table fare and are one of our most reliable sight fishing targets throughout late spring and summer. I believe there are a few different “migration” patterns for the cobia we catch every year in Tampa Bay. Last year we were catching some cobia into October, while many of the fish seemed to leave by mid to late summer. New science has revealed that our cobia may follow a few different patterns. Some cobia are considered residential and likely spend all year inside Tampa bay. 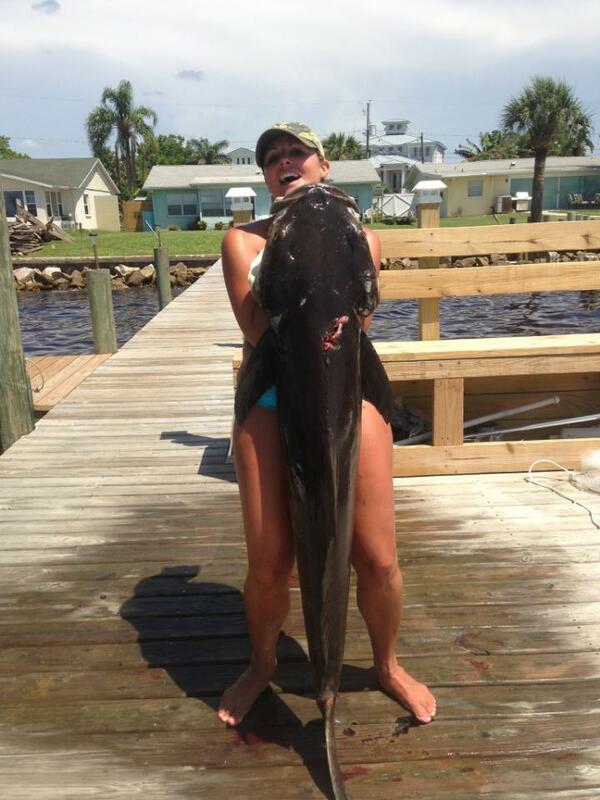 This is why cobia are often caught around power plants and other warm water areas, even in December and January. There is also another group of cobia that simply move west to east and vice versa. They likely move into Tampa Bay and the shallow surrounding areas every year during summer and move offshore the rest of the year where they are often seen in schools numbering in the hundreds by scuba divers as deep as 200 ft. There are also the group that we have always known to migrate north and south along our coastline. The mouth of Tampa Bay is a great place to focus your late spring and early summer cobia fishing efforts. The mouth of the bay is split by Egmont Key, making two funnel like passes which concentrate influxes of bait and cobia. There are two basic ways to fish for cobia in this area. The first and arguably the most effective is to sight cast surface cruising fish. Your eyes are your best and most important tool when pursuing cobia in this manner. This is where having a tower on your boat really comes in handy. Stand at the highest point on the boat that is safely possible, be it a tower, poling platform, or securely mounted cooler. These brown bombers can be found on area flats, cruising behind rays, turtles, and manatees or ambushing baits on fixed structures. When cobia are cruising on large rays in deeper water they often swim beneath the ray, using it for shade. When you see a big ray swimming in deeper water, cast your bait ahead of the ray as if you were trying to catch it. You will be surprised how often a hungry cobia will shoot out from under it to take your offering. Focus your efforts on any open water structures like range markers and buoys. Be sure to not only look around the structure, but look down any pilings, rope, or chain that might be attached to the bottom as cobia are often found suspending on these structures. The second method is to anchor and chum areas that are frequented by cobia. Shipping channels, rock piles, artificial reefs, and large markers are a great place to start. Like other pelagic fish, cobia respond well to chumming. Anchor up current of the structure and chum a mix of live and dead bait. Keep an eye on your chum slick as cobia will often come right up to the stern of your boat to investigate the source of all the free food. Have a pitch rod ready, as well as hooked baits in your chum slick. 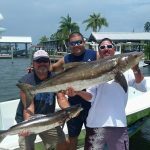 Often times there will be several cobia cruising together and one can be hooked right next to an already hooked fish, making for exciting double and triple hookups. Often times unresponsive cobia are determined to be “not hungry”, but often you just aren’t feeding them what they want to eat. Cobia are usually not picky eaters and readily eat most well-presented offerings, but sometimes you need to present them with a few different options to get them on the hook. My cobia arsenal consists of at least 6 rods rigged with 15-50 lb. test braid and 25-50lb. test fluorocarbon leader. Because it is often necessary to stay a bit farther away from cruising fish, make sure that you have a few setups capable of making long accurate casts. I like to have a mix of live baits, as well as artificials that can cover all levels of the water column. I usually have at least two live bait rods, one free-lined with a circle hook, and one rigged with a floating cork. Small crabs, live shrimp on a jig head, as well as pinfish and whitebait are some of the best options for this time of year. As far as artificials go, the traditional double hooked eel or Hogy is a must have. It is also wise to have a bucktail jig rigged up that can quickly work all levels of the water column and for vertical presentations. Sight fishing cobia on shallow flats and watching these normally slow moving fish race over to inhale your artificial bait on the surface is one of Florida’s ultimate fishing experiences. A little cobia fishing can be a great compliment to a day of snook and redfish fishing, but they are definitely a target worth dedicating a day to. Remember to handle cobia carefully boatside as they are notorious wreaking havoc on the gaff and on the deck of the boat.